We are delighted to announce instant messaging is now available on HealthUnlocked. Our development team works on building new features for the platform, taking into account the feedback we get from the users of the website. 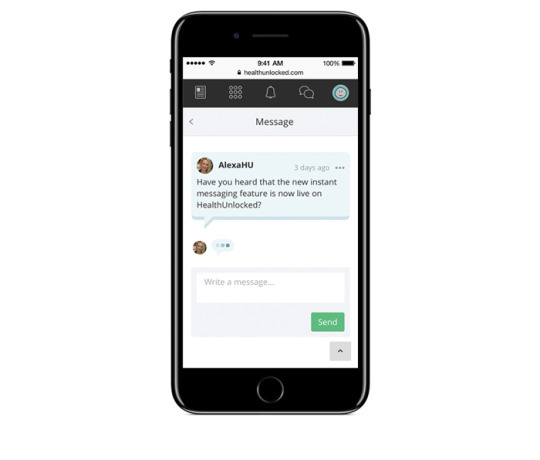 We have had a large amount of people asking us to develop an instant messaging feature, so we are delighted to now have it up and running for all users on HealthUnlocked. This means that people can now have instant conversations with users, which is quicker and easier than what was previously available on the platform. New messages also instantly appear on a message thread without any need to refresh the page. You will additionally be able to see when someone else is typing or responding to your message. We hope this new feature enables more people than ever before to connect with other people and share experiences of their health conditions or their well being journeys. We publish all details of our latest updates on the HealthUnlocked Latest Community.